2. 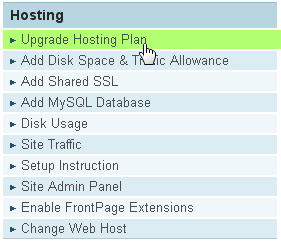 Click on the Upgrade Hosting Plan function in the "Hosting" section. 3. 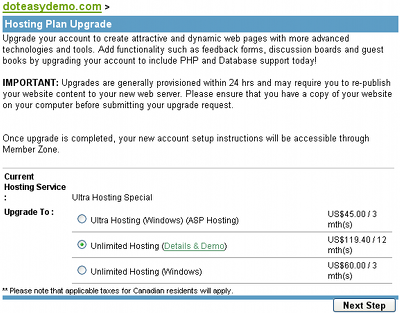 Select the desired upgrade option. When you are ready, click on the Next Step button. 4. 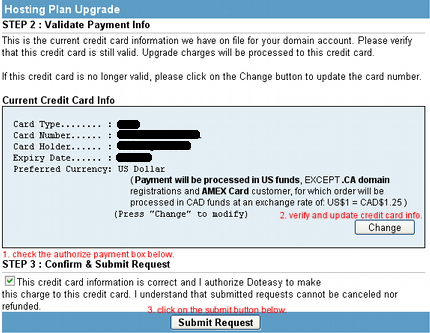 Make sure the payment information on file is valid as it will be used for your upgrade request. When you are ready, click on the Submit Request button. 1. Account upgrade requests are processed within 24 hours (up to 48 hours on a weekend or holiday). 2. The following account upgrades involve may a server migration. Please be sure you have a backup copy of your web files ready so that you can republish your website if needed.